A brightly colored hunting of open-country habitat, this species is recognized by its deeply undulating flight and a habit, when alighting, of flicking its tail. It feeds on the ground, taking seeds and insects. Outside the breeding season, it joins mixed feeding flocks composed of other huntings and canaries. • NliST A shallow cup nest made of grass and roots, lined with fine rootlets, and placed close to the ground in a low bush or tree. 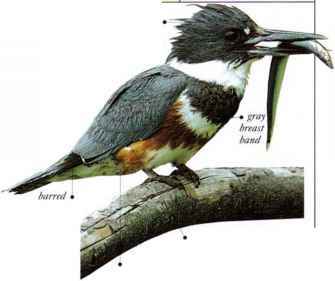 In spring, males of this species perch on the tops of reeds or bushes, uttering their three-note song. In winter. 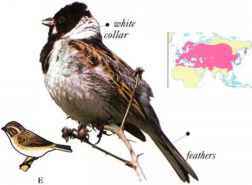 Reed Buntings join flocks of seed-eating birds on farmland. They feed on the ground, taking seeds and insects. • NliST A cup nest made of grasses, placed in vegetation on the ground or in a bush, usually close by water.